You are currently browsing articles tagged bubbly. 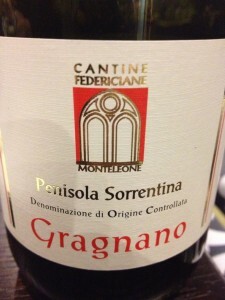 Piedirosso is an Italian grape that prefers volcanic soil and makes a wine called “Gragnano” so even before finishing this well-written article on Piedirosso, I needed to google where Gragnano is located and if it is close to Pompeii. Please see embedded map. Yes, right next to Vesuvius is Pompeii and right next to Pompeii is Gragnano, home to inky pastas and fizzy red wines. A short 39 minute drive down from Naples that requires driving around Vesuvius. Quite literally, when pairing that pizza at Motorino’s with Gragnano, you are drinking the volcanic fruits of an enormous eruption from nearly two thousand years ago (79 A.D. per helpful wikipedia). Fittingly enough, Vesuvius vino is fizzy. That bottle of red might look normal and dry but open it up and you’ll notice the bubbles raising to the surface, trying to find that cone of the volcano. Try shaking the bottle – will it explode all of your Pompeii doilies? An experiment still to be tested, perhaps in 2079 in memorial of the 2,000 year anniversary. That would be my 98th birthday and certainly seems permissible at the age of 98 to be as crazy as you like. Future nursing home – please consider yourself forewarned. I may bring Alka-Seltzer. * Gragnano is often cited as a fantastic accompaniment to pizza, one of the rare wines that Italians will actually drink with pizza. Beer is the more popular choice apparently. * Piedirosso literally means “red feet”. Jancis Robinson points that that this is because the bottom of the vine of this grape used to have red feet that looked similar to the red feet of pigeons… perhaps the only cute thing about pigeons. Lambrusco is a wine that I should like but don’t. It’s red, it’s bubbly and it’s just different. It’s the original red bubbly. Australia has started churning out full-on bubbly red in recent years (as opposed to the Italian semi-bubbly frizzante of Lambrusco), but finding a bubbly red is still very rare. Hence, the appeal of wine shops recommended Lambrusco even when it’s bad. Lambrusco comes in two styles – sickly sweet and drinkable – both of which have some basic characteristics. They’re red wine served chilled, slightly bubbly in that frizzante Italian way, and the alcohol’s on the lighter side (8-11%). Every Lambrusco I’d had until yesterday fit into that mawkish first category of sickly sweet, where the wine was often mistaken for a fizzy liquid lollipop. Apparently, this style caught on during the 1970s, right at the time of the Bee Gees and disco. Clearly a lost decade. The second style – drinkable – is becoming more popular and includes yesterday’s wine above. Dry, still fruity (but not egotistically so) and actually drinkable, it’s a wine for cold cuts, movie pizza and rainy Sunday afternoons. Thanks to its low alcohol content, any scintillating film critiques you share with your rainy-day couch companion will be understood in real-time. Lambrusco is a grape and not a grape. It’s the von Trapp family of wine. There’s a whole lot of individuals but nobody outside the family can distinguish very well between all those kids in the middle so they go by the collective “von Trapp” name. Same thing for Lambrusco. Ampelographers (wiki word of the day) know of at least 60 varieties of Lambrusco and yet “Lambrusco” is what you’ll find on the bottle. Italy has Lambrusco stamped all over its boot, and this applies historically as well as geographically. Cato the Elder enjoyed this wine back in the Roman days and (despite his puissant name) he wasn’t the first. The Etruscans were drinking Lambrusco long before Romulus found his wolf teat and started building all roads to Rome. Pretty dry but still good middle-of-the-road fruit (strawberry? ), enough fizz, and a slightly bitter finish. Better than any Lambrusco I’ve had (low benchmark) and actually worth having in the fridge. * Balsamic Vinegar comes from the same town as the Lambrusco stronghold in Emilia-Romagna. 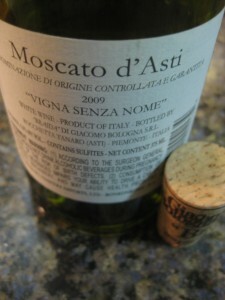 Moscato d’Asti is a semi-fizzy dessert wine if wine shops and their 15% off sales on “dessert wines” are to be believed. In my opinion, it barely qualifies as either. The wine is barely fizzy, although it has a few bubbles that sneak to the top of the glass like rogue spies. Perhaps they call it a dessert wine since it’s a sweet wine, and yes, it is sweet. But when I think of dessert wines, I think of high levels of alcohol to kick the night into full gear and well out of second gear. This wine, clocking in at 5.5% alcohol, puts that pre-gaming rush into the pitstop. This should be a pre-dinner wine for chocolate and sweet lovers who are easing into their meal, not the last stop before $1 pizza cravings kick in. Even with my gripe on the misnomer, this wine delivers in all kinds of ways. There’s the bit of fizz that’s barely noticeable in the deadly flirty way that hands touch hands in movie theaters, and there’s the taste of moderate, refined flavors. Peach, rose and pear sprout in the nose, then there’s a whole lychee swimming pool that shows up in your mouth and some sage and herbs sprout after the lychee lagoon drains away. None are too overpowering, they’re just really different flavors that somehow pull together into a wine that defines its “dessert wine” label. Think of Moscato (or Muscat) as the Abraham of wines. Pretty much all wines started with Abraham and then branched off from there (Ur being Piedmont, apparently) into all kinds of crazy Muscat-type wines. 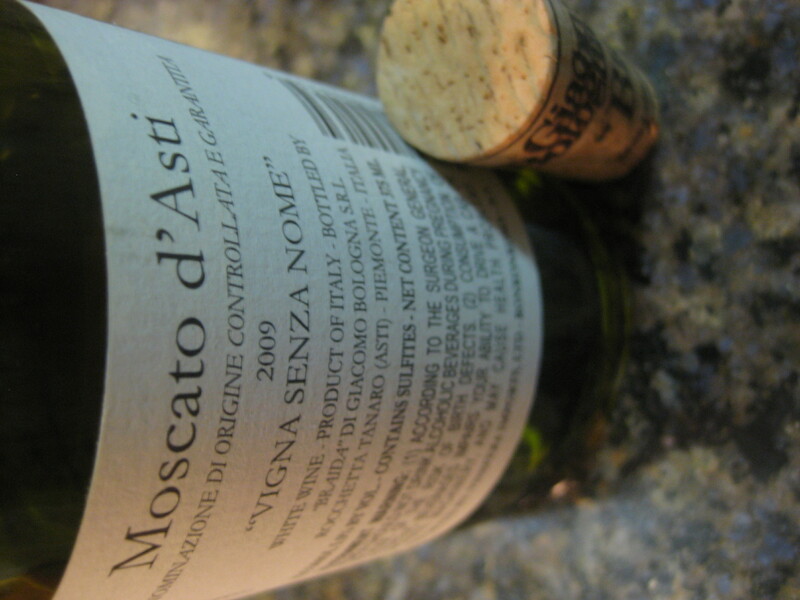 This particular wine is Moscato d’Asti (Muscat from Asti, up in Piedmont), which is made from the grape Moscato Bianco (“White Muscat”). I’m confused myself with all these Muscat names, but looking at the color of this wine (white) and where it’s from (Asti), the names are starting to make sense. Anyway, there are all kinds of wines that come from this Jacob-branch of the family, even other sparkling wines made from Moscato Bianco like Asti Spumante. Plenty of other Muscats exist on the Esau-side of the vini-family tree but it’s best to leave them for another day. Today’s all about Jacob and his Moscato Bianco. 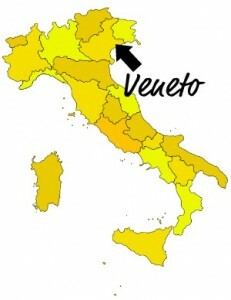 * Moscato Bianco is the oldest grape in Piedmont (that hambone chunk in the NW that bumps into France and Switzerland). 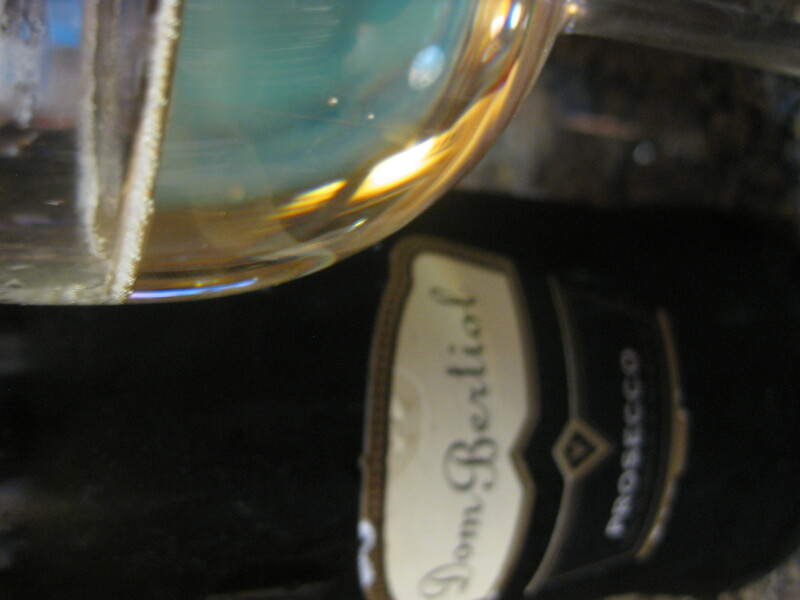 * Moscato d’Asti – first made by a wine-loving jeweler in the 1500s. Fact. Ortrugo must truly be an obscure grape, and I can prove it. First point, there are no good pictures of it on the internet, meaning it barely exists in the Web 2.0 world. Second point, the restaurant had only bottle of this stuff and said that it’s only grown in Piacenza, which is really far west in that shaded map above (seriously, no good pics). 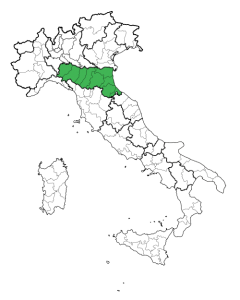 Third and most damning point, wikipedia had the name wrong (ortruga) on the Colli Piacentini page (“hills of piacenza”) that mentioned the various grapes grown in the region, of which only Ortrugo did not have a wikipage. If I’m the one fixing the wikipage, it’s really the apocalypse of the internet. The restaurant wasn’t lying when they said it’s only around Piacenza. All the blogs that talk about Ortrugo grape discuss a foreigner stumbling across Ortrugo in bucolic Italy, discovering its slightly fizzy zest and having their (presumbly sun-drenched) afternoon be completed like Jerry McGuire in the elevator. My experience couldn’t have been more different. Restaurant called Uva on the UES, freezing cold outside, after work in a suit, sitting at the bar alone, waiting for a friend. Find the romance in that one, Italy. All mawkish-ness aside, this Kyle Phillips guy wrote one informative post on Ortrugo and he’d have made the RSS feed if his last post wasn’t from July 2010. Well-worth the read, especially if you like getting an actual description of how the different types of Ortrugo taste. At the basic level, Ortrugo can be semi-fizzy or still (frizzante or tranquilo, in what I presume is Italian). 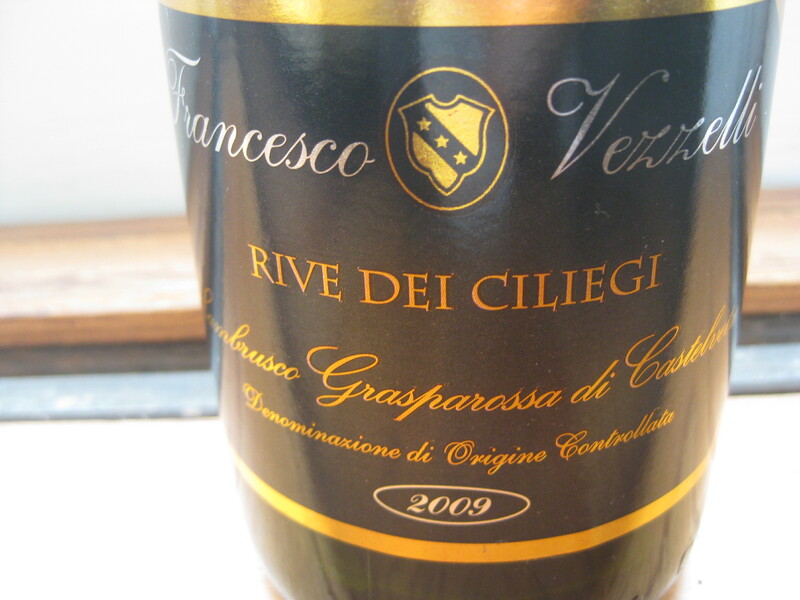 It can be straight (like all good alcoholic beverages) or blended (usually with Malvasia). My particular wine was fizzy and unblended, like a champagne gone right. I was thinking flowers and tart apple, maybe with a bit of rounder fruit like a peach, but mostly apple. 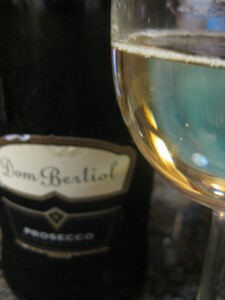 Little fizzy, lot of tart, lot of apple and, not too rounded – this is definitely my style of wine. Not sure where you find this wine other than Uva. * Trebbianino Val Trebbia is an important wine that only Italian wikiusers care about. It has Ortrugo and comes from Piacenza. * Known aliases of Ortrugo include: Trebbiano Romagnolo, Altrugo, Barbesino and Vernesino Bianco.